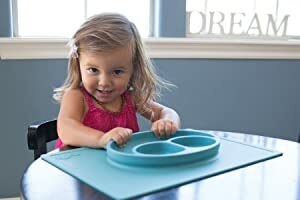 The Happy Mat is an all-in-one placemat + plate that suctions to the table, which means that it captures the mess and eliminates tipped bowls and plates. 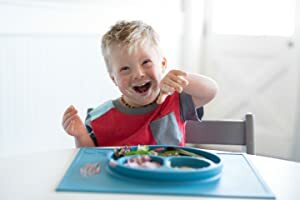 The Happy Mat's three compartments remind parents to serve a fruit or veggie, protein and carbohydrate and the smiley face design puts kids in the right mood for a positive mealtime experience. Portion sizes (the eyes and smile) are catered to toddlers at 4oz, 4oz and 10oz. Made from high quality silicone that is BPA, BPS, PVC, lead, latex and phthalate free. With Happy Mat's patented self-seal technology the Happy Mat suctions to any flat surface. Parents rejoice - no more tipped bowls and plates! 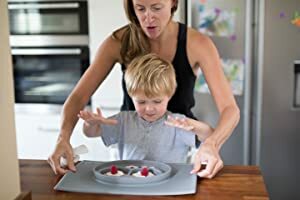 Due to the durable construction of the Happy Mat, parents can stack and serve 2+ mats with food, allowing for fewer trips to and from the table. The stability of the Happy Mat promotes self-feeding and develops fine motor skills. Made from high quality silicone that has passed the most rigid food safety standards. Since silicone doesn't fade or wear, the Happy Mat is built to last. 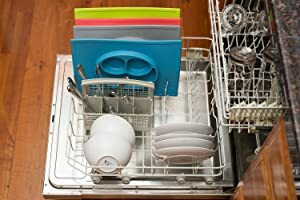 Mats can be rinsed with warm soapy water or placed in the dishwasher. Silicone is hypoallergenic and doesn’t harbor mold or bacteria. We love our mat less mess mat! It has made all the difference at meal time. It's not just the suction (which I love!) 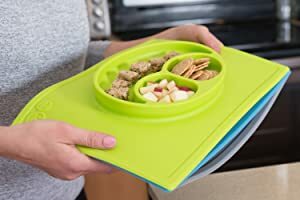 but also the convenience of making my little's plate, carrying the mat to the table, then when done picking up the whole thing and throwing it in the dishwasher! This mat really does make meal time mat! This is a must have for toddler mamas! Love this. Use it daily along with the bowl by ezpz. Love that it's dishwasher safe and doesn't harbor bacteria. This is perfect for my toddler who is transitioning to sitting at the table vs sitting in her highchair. Would definitely recommend to anyone with toddlers. Couldn't live without these mats. Use them for every meal. Shipping was also fast. Just got it and used it for the first time. It sticks to the table as advertised, It is large and might be better for a child older than the one year old I bought it for but she liked it and did eat out of it. I only filled the bottom large portion, but when she is older I'm sure the two others will be useful, also. She is too small to be able to reach the top two yet. High quality and and easy to wash. Yes, my son discovered he could pull it up from the sides (14 month), but we've managed to distract him from it. Plus it's not instant and we have time to push it back down. I love it, dad loves it, and the Boy loves it. We eat a hot dinner, and the Boy is now able to join the conversation. It's love. Our table is hand-me-down and the surface is no longer sealed completely as the previous owner tried to sand it. We own multiple brands of auction bowls and plates and nine stay longer than a minute at most. This may does! Sure, my daughter can move it with enough force but at 14 months she is more focused on her food. She does try for a moment here and there to grab the plate edge and pick it up or knock it over but I am present and engaged and distract her right away. She has yet to lift it.